Plenty of things in the ring or arena are unnatural to a horse, particularly if it's not his home ring. At shows, some of the bustle outside the ring makes focusing inside the ring difficult for your horse. Some horses are naturally nervous and may require extra care and time, while others need just a few repeated exposures. Typically the presence of other horses in the ring helps anxious horses relax, so arrange for a companion as yours gets acclimated to arena work. 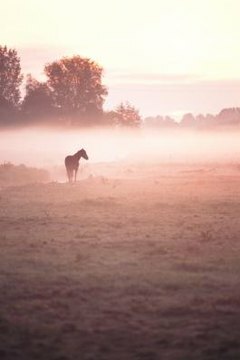 Prepare for your horse to be upset if the other horse leaves before you and your horse do, however; stay in there alone for just a minute or two after his companion leaves, letting him exit when he relaxes. On the flip side, if your horse seems offended by sharing the ring with other horses, he needs more exposure to sharing the ring to get used to the idea. If you can, allow your horse to greet others safely by sniffing noses so he becomes familiar with their scents. Allow your horse to investigate whatever is in the arena. If that means walking him by each jump, barrel, cavalletti or pole and letting him stretch his neck down and sniff it, take the time to do it. If he won’t go near an object with you on him, hop off and lead him to it. Don’t approach any object head on; because his eyes are set on either side of his head, your horse can’t see very well directly in front of him. Approach objects from the side and slowly allow him to turn toward them to investigate. Your horse easily picks up on your emotions. If you are nervous or scared, he thinks he should be nervous and scared, too. If your horse is making you nervous, it can be a “no-win” situation unless you can get your nerves under control. Force yourself to take deep breaths, exhaling slowly. If you are at a show, give yourself 15 minutes of quiet time before you enter the ring. Try visualizing what you want to accomplish. Don’t display anger, frustration or impatience with your horse in the ring or you’ll teach him to associate the ring with bad experiences. Your horse physically relaxes when his neck is stretched out and his head is low, much as if he were grazing. You can mimic this physical position by riding him with a long rein, squeezing your hand on the reins briefly to encourage him to lower his head. As soon as his head drops, stop squeezing to reward him. Then keep him focused by doing circles, serpentines and other patterns so he has to think about what you are asking him to do rather than what could be bothering him in the ring. If your horse is so intimidated by the ring that he balks at entering, retrain him to view the ring as a relaxing and happy place. A good tactic is to make him work right outside the ring. Walk toward the gate to the ring or arena and, as soon as he balks at entering, keep his feet moving. You can trot and canter in circles, and back him up -- whatever your space allows. As soon as you can get him to enter the ring, let him rest and slowly walk around. Now he sees the ring as the retreat. Repeat this each day until he walks into the ring willingly. YoungRider.com: Horse Training -- Stop Spooking! Why Do Horses Put Their Noses to Your Face?